Natalia Mela was born in 1923 to an illustrious Greek family, her ancestors being important figures of Modern Greek history. She was a tomboy, and defied convention, escaping the future her parents had planned for her, which she scornfully described as being ‘a housewife in pearls.’ She was Greek tennis champion in 1940, a nurse during the war, a student at a time few Greek girls went to university. She attended the Fine Arts School in Athens, where she studied under important artists, such as the sculptor Tombros. She also worked with famous architect Dimitrios Pikionis, and made sets for the theatre of Karolos Koun. Nata made her studio in an old stable in an Athens courtyard, and obtained a welder’s licence in order to work with metal. Her main inspirations were nature and mythology, and she used materials such as metal sheets and parts, chains, or even coins, to make her sculptures. She often made animals such as roosters, goats, bulls and doves, and she also loved working with marble and stone. Her chaotic studio was a meeting point for the Athenian intelligentsia of the time, such as artistsTsarouchis and Moralis, and poets Embiricos and Elytis. She met and married architect Aris Konstandinidis in 1952; they had two children, to whom she devoted her time for a number of years, only to take up her work with a vengeance after they were grown, keeping at it until a very advanced age. Nata loved life, and Spetses, where she first went with her parents as a child. She and her husband built a house there, to which she returned every year for long summers of relaxation and creativity. She liked to swim for a couple of hours every day, a habit she kept until old age. I had the pleasure of meeting her on a couple of occasions, and she was a formidable presence. She will be much missed. Yannis Behrakis, the Greek photojournalist who portrayed major events in politics, warfare, sports and society, has died from cancer at age 58. After joining Reuters 30 years ago, Behrakis covered many of the most tumultuous events around the world, including conflicts in Afghanistan and Chechnya, a huge earthquake in Kashmir and the Egyptian uprising of 2011. Born in 1960 in Athens, Yannis Behrakis was one of the top photojournalists in the world and Chief Photographer of Reuters Greece. During his life, he earned multiple prestigious awards in Greece and abroad, such as the Greek Fuji Award News Photographer of the Year (seven times), News Photographer of the Year by the Fuji Awards Institution in London, Barcelona and Rome (1999,2002 and 2003), and First Prize in the General News Stories category by the World Press Photo Foundation in 2000, the most prominent world distinction in the photography industry. In 2016, the Reuters photography team led by Behrakis, together with colleagues Alkis Konstantinidis and Alexandros Avramidis, was awarded the Pulitzer Prize for its coverage of the refugee crisis in the Aegean. The team captured a series of images of migrants crowded on flimsy sea craft and their first moments upon reaching Greece. For this work Behrakis was also voted best photographer of the year in 2015 by the Guardian. Behrakis was a talented and committed journalist, who won the respect of both peers and rivals for his skill and bravery. Most of us have seen at least some of his iconic images, which captured the terror of battle, fear, death, intimidation, starvation, homelessness, anger and despair, but also love and courage. In an obituary, Reuters write: He recognised the power of an arresting image to capture people’s attention and even change their behaviour. That belief produced a body of work that will be remembered long after his passing. What better way to ring in the new year than watching fireworks explode over the Acropolis? Athenians braved the rainy weather, forgot their woes, and came out with their umbrellas to celebrate. The photographs are from the daily paper Kathimerini, and provided some distraction from the otherwise continuing dismal news. What do we have to look forward to in 2019? Yet more rising taxes, elections, and a continuing and unmanageable refugee crisis. However, a brand new year always brings with it a glimmer of hope. And the feeling that here we are, alive and kicking—we made it through another year! A big thank you to all who follow, read my rants, and especially those who take the time to comment. I greatly appreciate it. All by best wishes for a wonderful 2019! Has anyone heard of Jericho Writers? It’s the new manifestation of what was formerly known as The Writers Workshop, a site offering editing services, manuscript critiques and such, to aspiring as well as established writers. I’d availed myself of these services a few times, and always found them excellent. They also ran the Word Cloud, a free writers’ community where a bunch of us chatted away, critiqued each other’s work in a very encouraging manner, voiced our opinions freely and ran informal writing competitions amongst ourselves. Finally, they organised various events, including the yearly Festival of Writing at York University, an extremely fun, inspiring and useful occasion where one can meet agents, writers, editors, publishers and, mostly, like-minded people. However, some time ago, the Writers Workshop was totally overhauled and ended up morphing into Jericho Writers, the excuse being that the technology propping it up was now obsolete, could not be improved upon and needed changing. Us old cronies in the Word Cloud were pretty annoyed about that: we did not like our habits interfered with, and we did not like having to pay for something which was formerly free. And, although we were promised the old Word Cloud would remain intact, while admitting no new members, it slowly became decrepit—as someone remarked,’It’s like a ghost town in there now.’ And maybe it’s just me, but the last couple of times I looked, it appeared to be dead. Maybe the technology did give up after all. However, it’s no use being grumpy and expecting things to remain the same forever, and I have to admit the new site looks both chic and user-friendly. So, (full disclosure,) I jumped at the chance of a free annual subscription in return for an honest review. Editorial advice: various forms of manuscript assessment (for everything from novels, to non-fiction to play-writing to children’s books). Also copy-editing. Tutored courses: A range of 7 online courses, including Debi Alpert’s famous ‘Self-editing your novel’ course. Sadly, I’ve never taken it myself, but others who did rave about it. There are filmed interviews with agents and writers, and Masterclasses, which are shorter courses on a wide range of subjects. These are free for members, as is a free advice service. Events: a few one-day seminars plus the Festival of Writing at York, which I mentioned above. I’ve attended a couple of time, and it was amazing. Literary Agents: there is a comprehensive list of agents in the UK and US, catering to all genres, and a service called Agents Match which helps you find a suitable agent. And finally the Townhouse, which has replaced the old Word Cloud community. Open only to members. The site is pleasant and easy to navigate, and members get a lot of freebies, and a discount on all paid-for services. Is it worth the annual €250 subscription? I must admit I did not have time to research other sites offering similar services, in order to make comparisons. I think that if you were going to avail yourself of what they offer on a regular basis, especially for people living within reach of London and who can attend the events, it would definitely be worth it, since their product is excellent (at least whatever I’ve tried or used so far). Finally, they did insist that reviews had to be honest, so I will admit to a couple of gripes. 1. The writers’ community, the Townhouse, is not there yet. The old participants are staying away (I’ve only recognized a few so far). A lot of the discussions are started by Jericho themselves, with little or no response from writers. In the old Word Cloud, you had to fill in a little profile, which made others get to know you a little. Now all you get to see is a plain name, mostly without even an image or logo. Also in the past you could form groups, ‘friend’ people, etc—it was very convivial. I hope it’ll get there eventually, but a lot of tweaking is needed. At the moment, it’s just like similar situations on other sites, whereas before, it was a special place to be. However, in the spirit of not being grumpy, etc, I have joined in, and will see how it goes. 2. Some corrections are needed in the list of literary agents, because a few names are repeated up to 4 times (i.e. Lisa Ekus), which is confusing and a little unprofessional. Also a lot of people on the forums seem dissatisfied with the Agent Match feature, complaining that it doesn’t work properly. Jericho have promised to fix it, but I confess to not having a personal opinion on the matter, since I haven’t tried to use it yet. 3. A final suggestion: it would be nice to have a course in memoir writing—I noticed the lack thereof because it’s something I’ve been interested in lately. To sum up, definitely worth taking a look (here). Even if you just subscribed to the newsletter to begin with, you get emails with lots of interesting tips, and you can always join in some events or take the occasional course at full price. Note: the photographs are all from their site. Couldn’t resist re-blogging this! From Bruce Goodman’s great blog, Weave a Web. 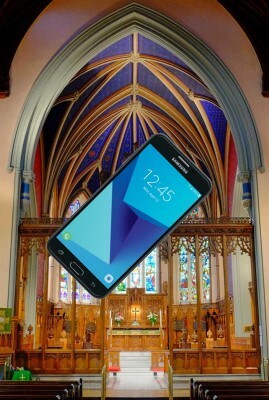 After entering this church, you may hear “the call of God”. However, it is unlikely he will call you on his mobile. Thank you for turning off your phones. If you wish to talk to God, by all means do so. Come in and choose a quiet place. If you wish to see Him, send a text while driving.